Again this year, students in Paul T. O’Connor’s opinion-writing class in the School of Media and Journalism at the University of North Carolina at Chapel Hill have contributed book reviews to Briar Patch Books. We welcome these reviews, which offer some different fare as well as fresh perspectives. Thanks to these bright students! HARRY POTTER AND THE CURSED CHILD. By J. K. Rowling, John Tiffany, Jack Thorne. Scholastic, Inc. 320 pages. J.K. Rowling cursed her legacy by releasing the script to Harry Potter and the Cursed Child as a book that’s part of her franchise. The magic was back. Potterheads around the globe dressed in black robes and flew to bookstores in hopes of reliving the wonder of the bestselling book series of all time. But Cursed Child deviated from the earlier works in the series in distinct ways. First, the book was not a novel but a script from the West End play that opened the same weekend. Second, Rowling was not the primary author of the work. Her name is on the cover in thick black type, but she only consulted on the script with playwright Jack Thorne and director John Tiffany. Last, the play and script cast Potter’s gang in secondary roles and focus instead on the second generation of wizards. The script starts where the books left off. The first scene is a re-enactment of the epilogue of Harry Potter and the Deathly Hallows. Harry is sending his second child, Albus, off for his first year at Hogwarts. The next few scenes quickly move through time until it settles on Albus’ fourth year at the school, where most of the action takes place. On the surface, this script should have been a welcome addition. The plot follows the narrative that fans have come to expect, and it answers the never-ending question of what happened next. However, page after page proved that the script was a great idea in concept but was very poorly executed. The characters are flat and one-dimensional. Unlike in the books, their dialogue feels flat and forced. Of course, some of this can be chalked up to differences in media. The characters would gain dimension on the stage that was lacking on the page. It is possible that watching the play leaves the viewer with a completely different feeling and impression. As a reader, I found it hard to care for the characters, even the ones from the original work. They lack the authenticity that made Rowling’s books famous. Additionally, the script panders to fans. Throughout the work, we reunite with many characters from the original books. However, clearly they are included as fan service rather than to move the plot forward. It is a common fan theory to believe that Snape has a heart of gold under his tough exterior, and the script plays into that so heavily it feels disingenuous to the saga as a whole. The script is a mess. One premise of the plot is time travel, and the principles applied in this script do not match with the laws of time and magic that Rowling laid out in her books. It seems silly to bicker about the technicalities of an impossible phenomenon, but if you accept the laws in Cursed Child, the whole plot of the third Harry Potter falls to pieces. Lastly, the plot is weak and predictable. Rowling was known for using plot twists and surprises to set her work apart, enabling her to transcend children’s literature and appeal to millions of adult readers. The Cursed Child plot reverts to simplistic and predictable children’s work. 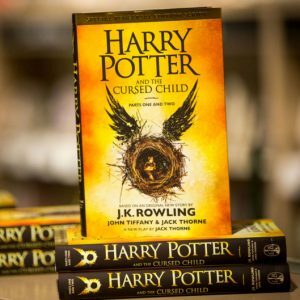 As a staged performance, Cursed Child might provide a valuable addition to Harry Potter world, but releasing it as a book tarnishes Rowling’s reputation and offends her fans. It might be worth £100 to see it live, but it will never be worth the $20 to read. This entry was posted in Popular fiction, Science Fiction/Fantasy, Young Adult and tagged Harry Potter, J.K. Rowling. Bookmark the permalink.